Rehabilitation is the process through which patients regain functions to allow them the chance to become independent. To enable this to happen patients usually need to have a “rehabable” pathology where there will be native structural repair to improved function. Rehabable pathologies include acute stroke with the natural pathological processes of resolution of oedema, recanalisation of obstructed vessels, removal of heme, reduced intracranial pressure, restoring cell membrane function and cellular pump activity, regained axonal activity, prevention of the inﬂux of calcium into the cell, removal of free radicals, alterations in glutamate activity, and the resolution or treatment of hydrocephalus. This can all help to get improved clinical outcomes. Often there may be associated infection or electrolyte issues that once addressed allow further improvements. Pathologies such as the typical neurodegenerative dementia e.g. dementias, Parkinson’s disease have a much more attenuated ability to be rehabable to regain function. Tumours again unless there is associated transient superinfection or treatable oedema generally have a poor response to therapies. Low Mood can lead to a lack of engagement until this is recognised and addressed as a particular issue. These improvements can be optimised and leveraged by therapists towards additional functional improvements. Both therapy and "use" can promote the formation of new synaptic connections. In the early days and weeks and months following stroke, there are healing pathological processes detailed below. Active rehabilitation can further improve outcome beyond that which would have been seen with a more passive approach. Other concepts such as neuroplasticity and simply “learning” by repetition and training can also help to explain improvements seen post stroke. Wade has described various features of rehabilitation: it is a process and not a single set of interventions, it’s the focus is disability and not disease, it must be holistic and should be multi-professional in assessment and delivery. I would add that the process must be patient centred focusing on meaningful but realistic goals for the patient. Rehabilitation needs to be goal driven. The goals need to be definable so that they are known to patient and carers as well as staff. Following the SMART goals model, they should be Specific, Measurable, Achievable, Realistic and Timed. Patients should be involved in the goals setting process where possible. Large goals should be broken up into intermediate ones. Goal setting, when done well, is motivational. A failure to achieve realistic goals in stroke can be a red flag suggesting there are issues such as incorrect diagnosis, further strokes, infection, depression, significant medical issues or profound frailty. Rehabilitation should continue for as long as it is delivering meaningful and sustainable benefits and so goals must be set and so progress or lack of it is clear. Once that state is achieved then the idea is that we cannot change the patient but we must change the world around them to focus on the optimal quality of life. There is a naive assertion that rehabilitation will improve everything but there are usually ever decreasing gains with time. It is important that maintenance of achieved activities continues led by the patient or carers following the end of therapy. The best way to maintain a skill is to keep doing it. Therapy is hugely important but patients need to have a desire to do therapy. It is hard work and fatigue is often an issue. Some patients refuse to engage and need to be screened for mood-related disorders. Patients who are severely cognitively challenged or unwell or have mental health issues can fail to engage and need as much support as possible to work with the teams. Frequent and meaningful MDTs should be carried out on patients. This has many benefits. The sharing of information which can be checked and corrected if wrong. An assessment of the current medical and rehabilitation status and a sharing of what current goals are. It will allow the team to look ahead and consider planning the following steps. It allows sharing of perspectives and views on progress or lack of. A written outcome should be documented. The core multidisciplinary team should include appropriate levels of nursing, medical, physiotherapy, occupational therapy, speech and language therapy, and social work staff . Other disciplines are also regularly involved in the management of stroke patients including: clinical psychologists, dietitians, ophthalmologists, orthoptists, orthotists and mental health teams . Stroke unit teams should conduct at least one formal multidisciplinary meeting per week at which patient problems are identified, rehabilitation goals set, progress monitored and discharge is planned. Family conferences between the multidisciplinary team and the patient, carers and family should be arranged to discuss goal setting. Members of the multidisciplinary stroke team should undertake a continuing programme of specialist training and education. Support should be given to help staff attain competencies. Substitution: focuses on functional adaptation to the deficit, through partially restoring neural networks and compensation for the lost or broken connections after injury. Substitution can be a process of partial reorganization of cortical representation for movement and changes in activity in components of the motor network. Compensation: aims to improve the mismatch between the patient's disability and expectations, as well as demands of the patient's environment. Compensation acts upon the locomotor system, and in particular it has an impact on increasing the time, effort and amount of training of the damaged skill?" There are patients who are initially too unwell, with low GCS or ongoing unstable symptoms or cardiorespiratory instability. Liaison with the medical and nursing staff can help define who may not be suitable for rehabilitation. There are some basic requirements and that is a patient who is well enough to engage with therapies. Ongoing sickness, vomiting, severe vertigo, diarrhoea and headache and such need addressed so that the patient can commit to rehabilitation. It is important to manage urinary tract infections, chest infections and heart failure and ensure adequate nutrition. There needs to be sufficient cognitive function for the patient to understand what they are asked to do and why and for some carry over so that there is progress. It is difficult to engage patients with severe delirium or dementia or significant mental health issues with active therapies. It is important for the teams to identify causes and actions plans to speed up the time to mobility. Most of the neurological recovery occurs within the first 3 months. The initial therapy can be delivered as an inpatient on the HASU with plans for either inpatient as early supported discharge for ongoing needs. Some patients approximately 5% may show ongoing recovery for up to a year. An improvement in some motor power may not be translated into a change in function. There are many factors such as patient motivation and mood and cognition involved in carry over between sessions. A small group do not benefit from rehabilitation as they have coexistent diseases such as active malignancy or severe cardiorespiratory disease or severe frailty or dementia or mental health issues and a lack of physiological reserve to engage meaningfully with what is often exhausting work for them. In most patients the first encounter is looking at simply getting a patient safely out of bed. Early mobilisation usually starts at 24-48 hrs post stroke. The therapists usually begin with sitting balance to see if a patient has enough position sense and truncal strength to sit themselves up with their centre of gravity in the midline. If this is intact then therapists can consider seating and get the patient out of bed. If the patient needs a great deal of support then a bucket chair is used. Comfortable chairs are such as they remove much of the active part of sitting which is an active process. The bucket chair provides a great deal of support. In the early days after stroke patients can tire quickly doing even very basic tasks such as sitting out, but this usually improves. In many organisations, the role of OT and PT often merges and many work together as a team and this is often optimal in delivering the most therapy in a window of time without the patient losing their concentration or becoming functionally fatigued. In general stroke patients should be mobilised as early as possible after stroke. However, the AVERT trial  ( A very early and more intensive rehabilitation) was associated with a reduced likelihood of achieving a favorable outcome at 3 months vs usual care in the first large-scale randomized trial of rehabilitation therapy in patients with acute stroke. First mobilisation took place within 24 h for most patients in this trial. It was a multicentre international trial. It may suggest that passive mobilisation may be preferable in the first 24 hrs. Suggested reasons may include increased falls risk, reduced penumbral blood supply and fluctuations in BP. It was a large trial in terms of typical numbers recruited but it took 8 years. Although the treatment and non-treatment groups were matched there was only 2000 out of 25,000 screened for the trial with 8000 declining and 7000 excluded as unwell. The trial defined a favourable outcome as modified Rankin Scale scores of 0–2 (no or minimum disability) and a poor outcome as scores of 3–6 (moderate or severe disability, or death). In the UK the current practice in the initial period is unlikely to meet the intensive criteria mentioned in the paper. All relevant staff should be involved in rehabilitation and much work can be done when therapists are not there. Patients should always be encouraged to do as much for themselves as their abilities and fatigue allow. Therapy staff will leave exercises and activities for the patient to do when they are not present. It is useful if nursing staff and health care assistants and families can continue this work. The rehab staff includes those primarily involved in caring namely the nurses and health care assistants, but also the physiotherapist and occupational therapists. Speech and language therapists looking at swallowing and speech, dieticians optimising intake and neuropsychologists looking at those with severe mood impairment. It is important that therapy staff and clinicians discuss patients. I often find a detailed therapy assessment incredibly good at picking up neurology which I may well have missed. It is important to always respect the advice and help of therapy staff who are often very experienced. For most patients, rehabilitation starts in the hospital and then can continue with early supported discharge. There is a general trend now to shortening the length of stay and moving rehabilitation to the community or home environment. Some may need transfer to an inpatient rehabilitation ward which may be off-site such as in a community hospital bed. For some who go to placement, some rehabilitation may continue if there are SMART goals still to be achieved. Visuospatial neglect: abnormal processing of externally derived visual-spatial information usually due to damage within the right parietal lobe. The possibility of rehabilitation. Vestibular and optokinetic stimulation, transcutaneous mechanical vibrations, electric vibrations, prism adaptation, etc. Upper limb weakness, spasticity and contractures are common complications experienced post-stroke and are very disabling. Spasticity and contractures restrict joint range of motion (ROM), limit function, cause pain, and may interfere with the performance of everyday activities. The use of Hand-splints and stretching is a common practice in some centres. A custom-made, volar forearm-based wrist-hand splint is the preferred splint among therapists. The aim is to improve ROM, stretching soft tissue contractures and reducing spasticity in the upper extremity. The practice, however, is largely unproven and the use of splints and stretching is variable. Splinting is not recommended for improving upper limb function was the statement by SIGN . The term ‘orthosis’ applies to an external device which is worn to aid function and mobility, reduce pain and accommodate deformities. Ankle-foot orthoses (AFOs) are considered where there is foot drop to try and prevent mechanical falls. There is some evidence that stroke survivors may have a better functional recovery if they are prescribed an AFO than if they are not prescribed an AFO. Where the aim of treatment is to have an immediate improvement on walking speed, efficiency or gait pattern or weight bearing during stance, patients should be assessed for suitability for an afo by an appropriately qualified health professional . Clostridium botulinum toxin type a (Botox®) may be considered for use to relieve spasticity following stroke where it is causing pain or interfering with physical function and the ability to maintain hand hygiene. Injections may need to be repeated every three to four months and should be discontinued if lack of efficacy. Botulinum toxin should only be used by those with appropriate training and care is required with administration as the unit dosage of botulinum toxin differs between manufacturers. Falls are a common feature for patients after stroke. The complications can be severe with soft tissue and head injurt and fractured hips, humeri and more. Measures should be taken to minimise the risk of falling. Evidence from studies including older people support a multidisciplinary multifactorial approach. Individually prescribed muscle strengthening and balance retraining programme, withdrawal of psychotropic medication and home hazard assessment and modification in people at high risk, for example with severe visual impairment, have been shown to be of benefit in reducing falls. These interventions are likely to be an integral component of well organised stroke care . Post-stroke fatigue is common and disabling. Patients with post-stroke fatigue should be screened for depression which may be treated. There are various definitions. Generally the fatigue has led to difficulty taking part in everyday activities (for inpatients this may include therapy and may include the need to terminate an activity early because of fatigue. Fatigue also impacts adversely on health-related quality of life. To date there have been no effective drug treatments. Appropriate patients should be referred to the dietician. The ReTurn is a multi-functional, pivoting and transportation platform. For users who still retain some strength, ReTurn stimulates the natural pattern of moving when progressing from sit-to-stand and it also strengthens a range of muscles. Able to move in any direction, the ReTurn is easy-to-use and allows perfect positioning on the chair every time. Having a range of hand-holds allows the user to position their hands in the optimum position for the transfer. For transfers out of a low chair, the user can raise their hand position during the transfer, like climbing a ladder. The ReTurn belt supports the pelvic area and is used as a handling belt during the raise. Once the user is stood, it attaches to the ReTurn to secure and hold the user during turning. Sara Steady Stander. Another device to help with transfers. 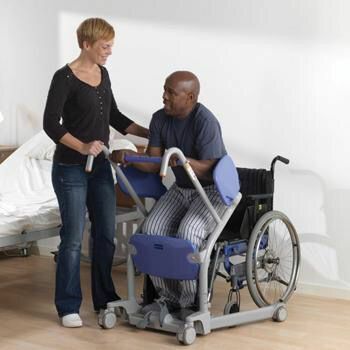 The Sara Stedy is used to encourage mobility and assist in standing transfers for users with weight bearing ability. Tilt in space. 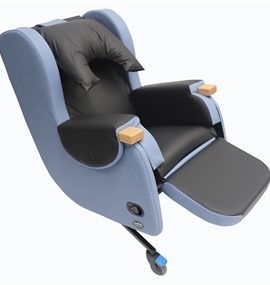 Supportive chair for those patients in early days to enable them to get out of bed. The chair provides good lateral and back support and allows tilting and positioning. Once truncal balance and awake would aim to transfer to increased sitting out and then a normal chair with shoulder and skin protection. 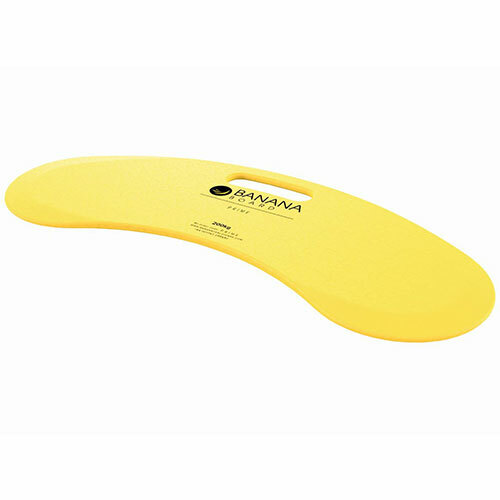 Banana board/transfer board is just one type of device that allows a patient to transfer from one surface to another by sliding laterally. This may be from a bed to a chair or wheelchair. Depending on abilities can be done independently or with a carer. There are various different types but the principle is the same. 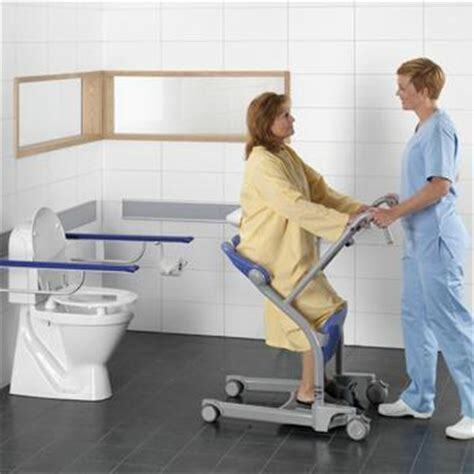 A wheeled commode can be useful to allow toileting out of bed when the patient cannot mobilise as far as the toilet. These may be used at home for the same reason when the toilet is too far away or on another level. It needs an able-bodied person to clean them afterwards. The patient needs to be able to transfer out of bed with minimal assistance and to be able to sit securely on the commode. Bed lever can help patients with weakness to sit up and to get out of bed. The horizontal part slides under the mattress. Constraint Induced Movement Therapy is a form of rehabilitation which restrains the unaffected side to focus entirely on the affected side. The constraint may be with a sling or mitt for 90% of waking hours, while intensively inducing the use of the more-affected arm. Repetitive training of the weak limb is usually performed for six hours a day for a two to three-week period. Compliance of the patient for this is needed. Benefits may be seen in those individuals with some active wrist and hand movement. Studies have explored the efficacy of this intervention for improving functional outcomes post-stroke. Walking aids should be considered only after a full assessment of the potential benefits and harms of the walking aid in relation to the individual patient’s stage of recovery and presentation .Individual patients may gain confidence from using a walking aid. If walking aids improve gait, balance, quality of life and independence, or reduce falls, after stroke, they could provide a cost-effective intervention. However they may upset gait patterns. Pre-discharge home visits should be undertaken for patients who require them. These are usally done by the members of the multidisciplinary team (usually an OT) and aim to give staff (hospital and community), stroke patients and carers the opportunity to identify actual and likely problems, as well as to address any other needs that the stroke patient/carer may have. Patients with mild/moderate stroke should be able to access stroke specialist early supported discharge services in addition to conventional organised stroke inpatient services. The ESD teams should consist of a specialist multidisciplinary group including nursing, medical, physiotherapy, speech and language therapy and occupational therapy staff. The DVLA stipulates that we must tell patients that they must not drive for at least one month after their stroke. If there is a lasting deficit that affects driving beyond a month patients should self report to the DVLA and should not drive in the interim. I usually discuss this at 6 week follow up. Issues will be an evaluation of visual problems, motor weakness or cognitive deficits. They should only resume driving if their physician/GP agrees, or after formal assessment. When assessing whether a patient has made a satisfactory recovery, clinicians should be vigilant to possible executive function impairment. 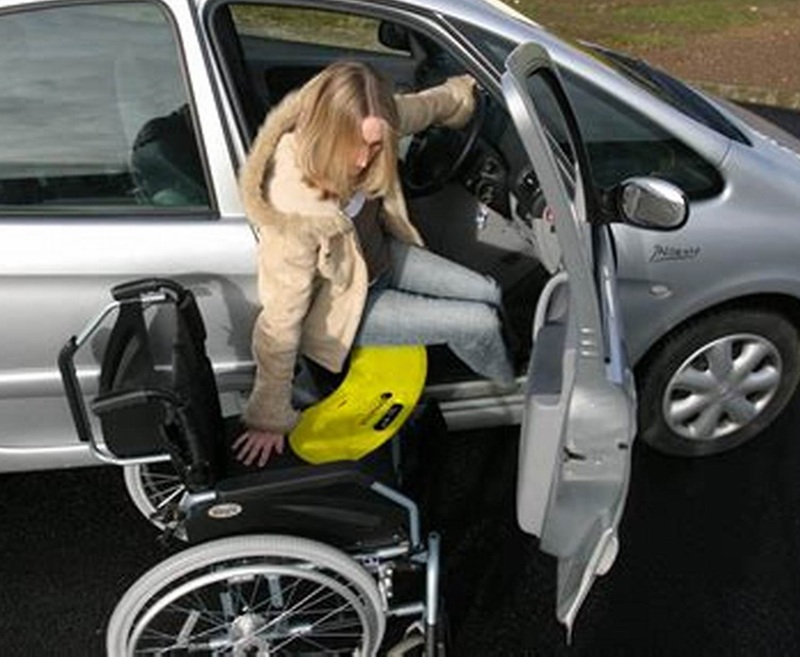 If there is doubt about a patient’s ability to drive, patients should be referred to the local Disabled Drivers’ assessment Centre (details available from the DVLA. This is an active area of rehabilitation study. Rehabilitation is performed by the patient in concert with therapy staff. Physiotherapists look, particularly at physical aspects. Abnormal tone, weakness, ataxia and other neurological functions. Their job is to work to accentuate improvements in tone, weakness, balance and translate these into functional return such as the ability to walk safely. The occupational therapists look more at the next step which is suing the improvements in weakness, tone and dexterity to do things that can aid independence - to wash oneself, to change clothes etc. They can also look at higher functions such as mood and cognition. How decisions are made. They are focused on looking at tasks such as a kitchen assessment which of themselves are valuable tests of vision, strength and cognitive function as well as organisational skills and executive functioning. It's quite fascinating the level of complexity and the information that can be learned by watching a patient perform a simple kitchen task. FIM is a basic indicator of disability severity. 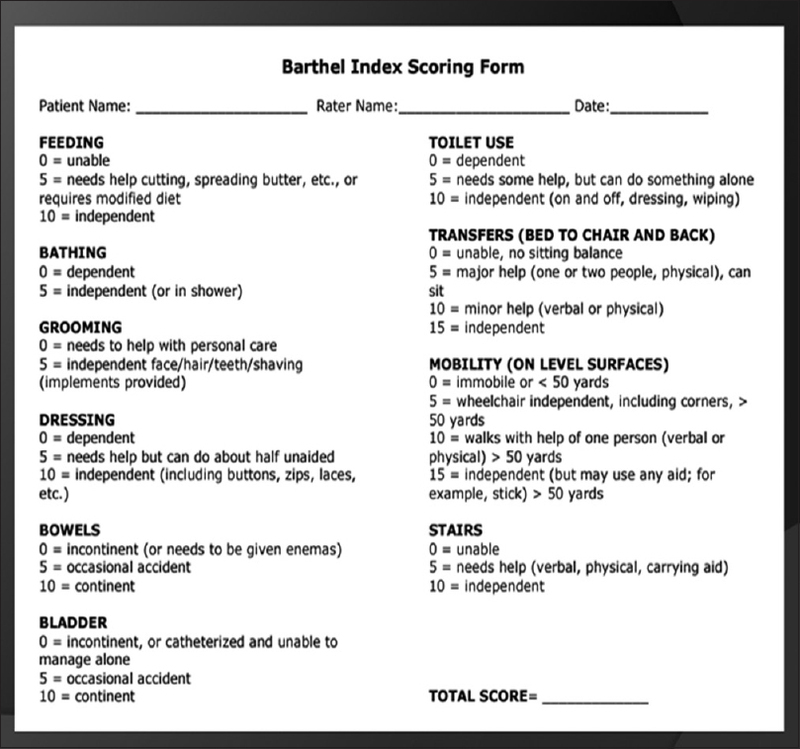 The Functional Independence Measure (FIM) was developed to address the issues of sensitivity and comprehensiveness that were criticized as being problematic with the Barthel Index. 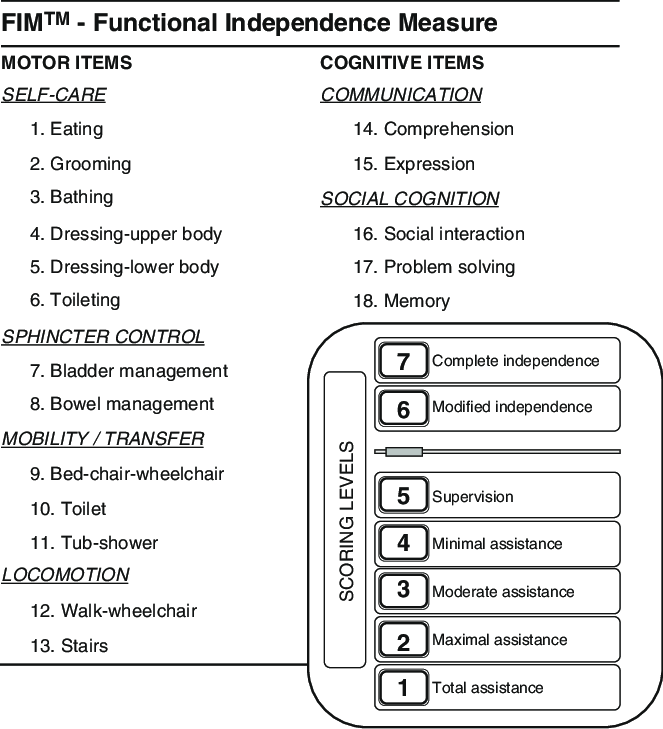 The FIM (range, 61 to 126) consists of 18 items, each of which is assessed against a seven-point ordinal scale; the higher the score for an item, the more independently the patient is able to perform the tasks assessed by that item. Secondary clinical outcomes can be assessed such as FIM gain (discharge FIM—admission FIM), FIM efficacy (FIM gain/length of stay), and amount of independent exercise. 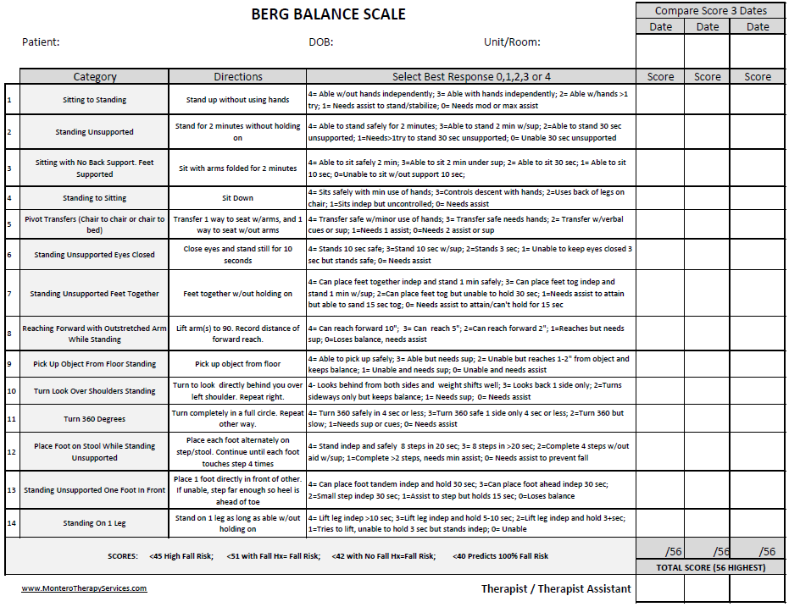 The Fugl-Meyer Assessment (FMA) is a stroke-specific, performance-based impairment index. It is designed to assess motor functioning, balance, sensation and joint functioning in patients with post-stroke hemiplegia (Fugl-Meyer, Jaasko, Leyman, Olsson, & Steglind, 1975; Gladstone, Danells, & Black, 2002). It is applied clinically and in research to determine disease severity, describe motor recovery, and to plan and assess treatment. Main role is to quantitatively assess balance in older adults and can be used in the post-stroke assessment.